PA’LANTE plays a fiery, potent mix of highly danceable, uplifting salsa and Latin jazz. Their music ignites audience participation with its irresistible Afro Cuban, Latin, and Caribbean rhythms and its big 9-piece band sound. A rich multicultural experience, a Pa’lante concert reflects the influences of Cuban and Latin music masters like Tito Puente, Eddie Palmieri and Mongo Santamaria, as well as the modern trends in Cuban and Caribbean music. The band is beloved by dancers for their high-spirited presentation of salsa, timba, merengue, Cuban son, cumbia, cha cha cha and other danceable styles. The musicians are outstanding players, deeply accomplished in Latin music and jazz. They may even surprise you from time to time with an Afro Cuban folkloric number, always a treat. The dancers were out in full force at Dawson Park! 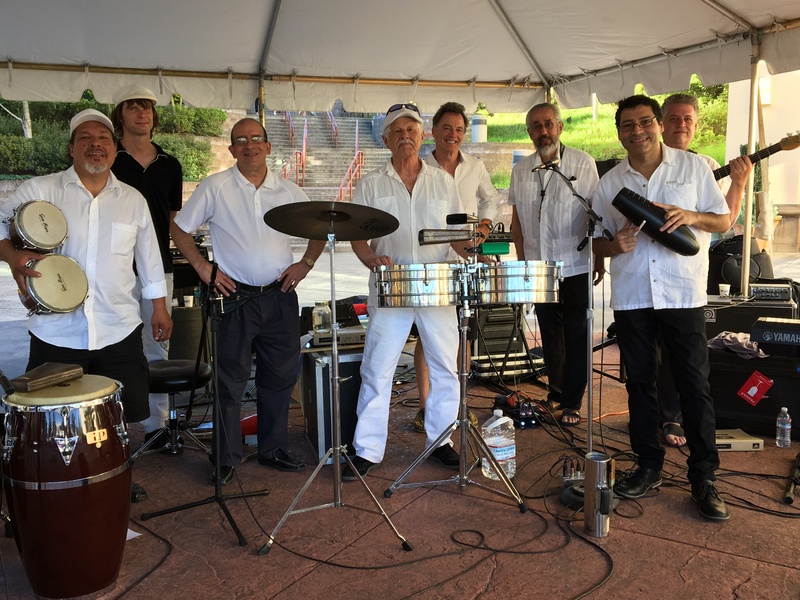 Pa’lante has performed to wide acclaim all over the Portland area, Willamette Valley and Southwest Washington, including being invited to open for such Latin luminaries as Tito Puente and Mongo Santamaria. Variations: Pa’lante can provide delightful musical pairings for your events – whether a concert, wine or craft beer tasting, picnic, wedding, celebration or festival! We tailor our size and sound to your needs, from an intimate straight-ahead jazz trio or quartet with a Latin flavor, to our Latin jazz quintet, on up to the highly danceable “full strength” 9 or 10-piece band rich with uplifting, irresistible salsa, Afro-Cuban and Caribbean rhythms. A huge crowd braved 100 degree weather for Pa’lante’s recent concert at the Cathedral Park Jazz Festival. Many local music venues, weddings indoors and out, quinceaneras, parties, bar and bat mitzvahs and celebrations of all kinds.